New/unworn Omega Globemaster Co-axial Master Chronometer Annual Calendar 130.23.41.22.06.001. 41mm Steel and Sedna gold case. Slate grey dial with rose gold-tone hands and index hour markers. Luminescent hands and markers. Date display at the 6 o'clock position. Fixed Sedna gold bezel. The Annual Calendar complication will accurately account for the current number of days in each month with the exception of the 29th day of February in a leap year. 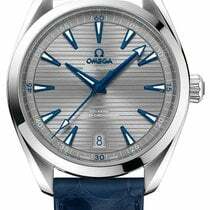 Omega Co-axial Calibre 8922 automatic movement with 55 hours of power reserve. Scratch resistant sapphire crystal. Exhibition case back. Case thickness : 14.7 mm. Brown Crocodile leather strap with a deployment clasp. Water resistant at 100 meters / 330 feet. E.U Box and Full Omega Warranty Papers dated 2019. Available for a full vat refund for all non-EU customers exporting this watch personally. This service is available through premier tax free shopping. If you would like to part exchange any watch then please send us an e-mail for a quote. We also buy watches and can pay by bank transfer or cash. As the watch is unworn the picture you see is a library picture!! We sell only what we have IN STOCK! For privacy purposes and to deter counterfeiters, names and serial numbers of the watch maybe removed from pictures. Our pre-owned watches are systematically checked and restored if needed. Our watches are sold in perfect or nearly perfect condition. They have also been referenced against technical documents and manufacturer records where available to ensure authenticity and a clean history. All watches presented can be seen and picked up in our office in Wilmslow, Cheshire at your convenience or sent by insured courier. Please note that office visits are by appointment only and because our watches are securely stored away from our offices in a bank vault, we usually require 24hours notice for a viewing. If you are not delighted with your purchase then we are happy to refund your full purchase price within 14 days of receipt, just return the watch to us as you received it and we will refund by the same payment method. Founded in 2013, Chronoedge Limited specialises in sourcing and offering pre owned & unworn watches which we have in stock at the lowest possible price. By only selling watches which we have in stock we can offer certainty, speed of transaction and the best possible service. We each have over 25 years of experience in the UK luxury watch & jewellery industry in Sales, Admin, Management and Director level roles for both independent and multiple retailers & brands. Having worked directly with the all the major Swiss brands allows us to understand the product and the market better than most independent dealers. As well as aiming to offer the best price on very low margins, we have a wealth of experience ensuring you receive expert advice and guidance. As we are office based we can keep our overheads low and therefore offer very competitively priced fine watches. Please feel free to email with any question and check out our Chrono24 history & reviews plus over 200 Trustpilot reviews on our website. We can provide any assurances you may require. Many thanks Andrew & Lee at Chronoedge Limited.